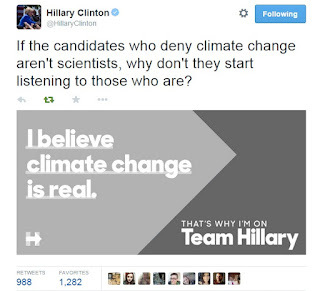 Hillary Clinton delivered her first major campaign speech over the weekend, painting climate science denial as part of the same elite obstruction that keeps wages down and public infrastructure shoddy. The Russell Sage Foundation polled the 1% (average income of $1 million or more a year) and found they're 37% more likely than the average American to say we should cut environmental protections than expand them. As David Roberts writes at Vox, there's growing evidence that, as a group, rich people are selfish jerks.